Anyways, today we'll be having Laphroaig Cask Strength. This whisky was awarded Best Single Malt Whisky in the World by Whisky Magazine in 2005. As many of you know, the regular strength 10yo has been discontinued in some markets, in particular in Canada where folks have been active on forums and in emails to me (and others, I am sure) asking, "why?!" I have addressed the question in past posts but here is an email from John Campbell to the Canadian Friends of Laphroaig. Hoping that you are all well and like us over on Islay, enjoying some autumn sunshine. For some time now, a number of you have been writing to us and asking about Laphroaig in Canada; therefore, I thought I should let you know the latest news. Unfortunately due to supply we have had to withdraw Laphroaig 10 year old from Canada - we simply do not have enough. I'm very pleased to say though that the first shipments of our Award Winning Laphroaig Quarter Cask are on their way to liquor stores near you. Laphroaig Quarter Cask, is perhaps our most authentic Laphroaig, with production methods familiar from two hundred years ago. 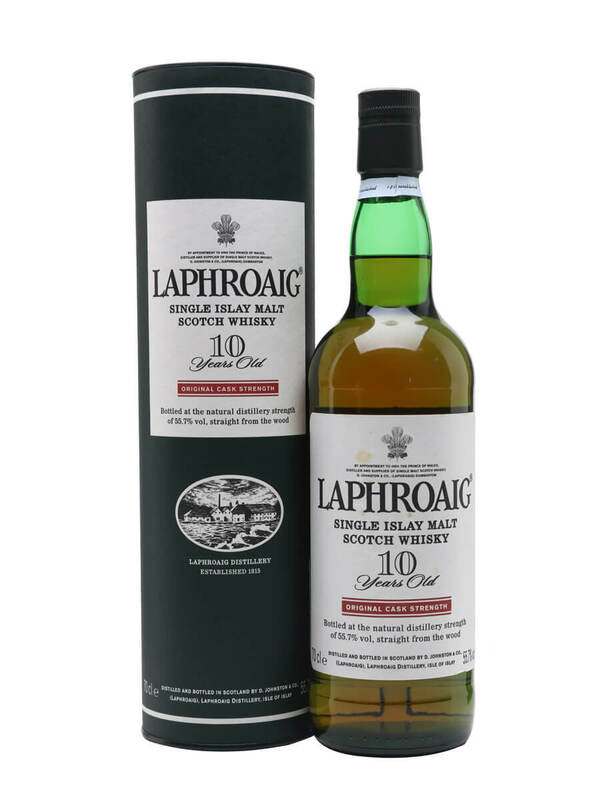 It's indeed an award winner, taking the gold medal at the 2007 San Francisco Wine and Spirits Competition and has a full bodied, complex, smoky and slightly sweeter palate than Laphroaig 10 year. Laphroaig Quarter Cask is created from a range of ages, up to 10 years of age and is a new expression, which we are able to supply to Canada as a replacement for the 10 year old. Suffice to say, we are all proud of it here in Islay; it seems to be going down well over in this neck of the woods! If you would like to know more about Quarter Cask, please go http://www.laphroaig.com/whiskies/quarter_cask/ Be sure to welcome this bit of Islay genius into your homes. Okay. So there we go, a personal note of apology... no explanation... no, advertising for Quarter Cask. Why!? Quarter Cask is great, critics and drinkers love it. Shhh. Stay on topic! Tell us WHY there is not enough Laphroaig 10yo for Canada. The fact is that this 'explanation' is highly unsatisfactory to many folks, it really is. This is not my opinion, it is the opinion of many others openly expressed all over the web (and in a Whisky Mag letter to the editor this month) with varying degrees of anger. Just look at any whisky forum online, THIS or THIS? And it is not just Canucks who have an opinion, whisky nerds with all colours of passports are weighing in. Most whisky enthusiasts are aware of the big push for expansion in emerging markets of China, India, Russia, etc(read more HERE, HERE or go look it up yourself). It is even news beyond the pages of whisky nerd fora, websites, blogs, and magazines, to my knowledge it has been announced in the British mainstream media on at least a few occasions. To have a loyal customer base completely aware that they are being abandoned for new customers makes any explanation difficult to accept, but to say "we don't have enough" is only half of the truth, or more accurately, only half of the sentence; "we don't have enough FOR YOU"
To be fair, this is also partly a problem with the LCBO, BC Liquor, etc. These provincial monopolies have one product call per year and have a minimum volume (for standard stock). The biggest obstacle to getting the drams Ontarians want is not Beam Global but the LCBO itself. But this controversy has both parties wrapped up in blame and if you can't be honest with your loyal existing customers, what kind of misrepresentations are being practiced to earn new ones?!? For more distillery info or to see other Laphroaigs had on the mission click HERE. Soft and sweet for the abv%. Sherry impressions via faint sulphur, but it is seaweed, drying on a beach. Rubber boots. Chocolate eclairs, cheddar cheese, grapefruit. Then the stuff I most often find in Laphroaig: antiseptic creams, hay, and horse manure. Great warmth. Flavours spread like warm water in a cold tub. Oak and smoke arrive first. Sweet honeyed peat, minty white antiseptic cream, gentle heat. Shortbread. Red licorice Nibs. Late soapiness(or more antispetic? ), with lingering toffee or fudge all wrapped up in peat smoke. Quite big, yes, but certainly less offensive than the stereotype, and full of complexity. Crazy mix of flavours, like a smoky cirtus PrepH fudge. Ew. Sorry. Laphroaig for folks who love Laphroaig. Be warned that water brings out lovely oaky, smoky, and biscuit flavours but kills the palate eruption effect... for me. Thanks for the note regarding the lack of Laphroaig 10YO in Canada. I just ran out and went to pick up a bottle only to discover--to my extreme horror!--that it's all gone. I reluctantly picked up a bottle of the QC (at a cruel $78) and discovered that I really don't care for it. Look, Laphroaig is one of my all time favs: it's solace in a bottle, utterly glorious, so I'm really dismayed that there's no more 10YO. I'll drink the QC and it'll probably grow on me, but it just lacks the 10YO's youthfulness, clarity, and purity, to my mind. This is a sad day for Canada. One reason why I loathe and detest provincial liquor boards. Mercifully, I'll be able to head to Alberta at Xmas and still score some 10YO. Three cheers for privatization!